← Yay! I wrote again today! I can write about my church, right? Sunday = church = blogging about church. I’m Catholic–dunno if you could tell or if I ever mentioned it before. I’m not about to go back trawling through my old blog posts to figure out for sure. Recently, Cardinal Francis George was comparing the gay rights movement to the Ku Klux Klan. Ya, srsly. Gays = KKK. I can totally see that comparison *rolls eyes. * A friend of mine pointed out that gay people could never be part of the KKK because all the sassy gay people have better fashion sense than to wear white during the part of year when it’s supposedly verboten. Why did the Cardinal even think to make such a comparison in the first place? What brought it on? Well, apparently the Chicago Gay Pride Parade’s new route was going to block people from being able to enter a Our Lady of Mount Carmel for the 11AM Mass. 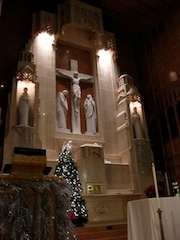 (And this particular parish is actually one where the Archdiocesan Gay and Lesbian Outreach Chicago is headquartered…) The parish then got in contact with the organizers, and they worked out a compromise–delay the start of the Parade by a couple of hours so people can still attend Mass. It worked out decently. Cardinal George–I don’t know how much of it he knew before his interview, so one has to consider that. One also has to consider my opinion that if you don’t know enough details, you should say as much. “I don’t know all the details, but I can say this…” You know? Not that hard. Still, as one can witness from the politicians and celebs and so on, sometimes being in the public eye means you say a lot of stupid things. Archbishops and Cardinals included. The Cardinal did make a grave error in this case, and he erred even more when he reiterated his comparison in later statements. Seriously, gay people are not akin to the KKK. Sure, there may be a few radical ones who hate the Catholic Church, but most of them don’t really care what the Church thinks about gay people. They just don’t think the Church should be foisting its beliefs on public laws, especially since not everyone shares the Catholic view of morality. I don’t think any of the gay people want to lynch Catholics randomly to make an example of us. One has to earn respect. It can take a long time to build it, but one stupid remark (and the fact he was reiterating that remark for a while) can erase it all. The interesting thing here was that the Catholic Church was not disrespected by the Pride Parade in the first place, as many people think. Error of omission, perhaps, but I doubt they did it specifically to “make an example” to the Catholics, judging from their quick agreement to delay the start of the parade so Mass wouldn’t be affected. (One wouldn’t call the Chicago Marathon disrespectful to the Catholic Church because the route makes it very difficult to make it to church at Holy Name or at St. Peter’s in the Loop, for example.) But because Cardinal George perceived it to be disrespectful, he proceeded to be disrespectful himself, a grave error which many of us probably have fallen into from time to time. On a broader note, most people respect the Church for its history, its longstanding effort to bring the world to Christ. However, respect for long-term history doesn’t correlate into respect *today,* respect for the shorter-term history. Some people have lost respect for the Church because of the actions of some of its leaders, like Cardinal George’s remarks, the Church’s political involvement, or the bishops and priests who participated in and covered up child abuse, and many other things which I won’t list here. The specific events that cause people to lose respect for the Church can vary greatly–just as the events that bring people to the Church varies greatly. It’s an ongoing process, and each of our own actions as Catholics reflect back on the Church. This entry was posted in Uncategorized and tagged cardinal francis george, catholic, chicago, faith, gay rights movement, kkk, pride parade. Bookmark the permalink.